walk in [join] a parade 行列を作って練り歩く[行列に加わる]. a parade of strollers 次から次へと続くそぞろ歩きの人たち. make a parade of… …を見せびらかす. The military band paraded the streets. 軍楽隊が街路を練り歩いた. The military band paraded through the town. 軍楽隊は町をパレードして歩いた. self‐serving lies parading as truth 真実としてまかり通っている私利的なうそ. The brass band paraded the main street. Workers parade on May Day. 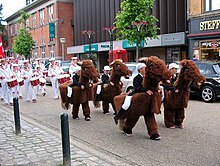 A band marches in a parade in Denmark. Borrowing from French parade (“show, display, parade, parry, formerly also a halt on horseback”), from Spanish parada (“a halt, stop, pause, a parade”), from parar (“to halt, stop, get ready, prepare”), from Latin parare (“to prepare, in Medieval Latin かつ Rom. also to halt, stop, prevent, guard against, etc., also dress, trim, adorn”); see pare. Compare parry, a doublet of parade. An organized procession consisting of a series of consecutive displays, performances, exhibits, etc. displayed by moving down a street past a crowd of spectators. The floats and horses in the parade were impressive, but the marching bands were really amazing. The band that played in the Queen’s birthday parade died when you lost sight of it. (dated) A procession of people moving down a street, organized to protest something. The strikers had announced a parade for Tuesday morning, but Colonel Nixon had forbidden it, the newspapers said. Any succession, series, or display of items. The dinner was a parade of courses, each featuring foods more elaborate than the last. […] he applied himself to his Bible morning and night. Its narratives frankly puzzled him—the parade of bearded kings and prophets, their curious ravings. […] there was a degree of order in the books, a parade of Loeb classics, archaeology, ancient history. A line of goslings led by one parent and often trailed by the other. (countable, uncountable) Pompous show; formal display or exhibition; outward show (as opposed to substance). […] Formes little Different from those of a Gally, to no more Thriving an Intention in reference to the Publick, Then Apothecaries paynt and adorn their Shops which is to delude the Ignorant, and hide from Inspection such Arts as lye more in Parade then Substance. What good Conduct does he shew! what Patience exercise! what Subtilty leave untry’d! what Concealment of his Faults! what Parade of his Vertues! what Government of his Passions! At least, before your Master’s Debts are paid. […] with all his good and agreeable qualities, there was a sort of parade in his speeches which was very apt to incline her to laugh. (military) An assembling of troops for inspection or to receive orders. That of the Tulip Pinke and Rose. The next night the soldiers began teaching the girls to dance […] . Claude saw that a good deal was going on, and he lectured his men at parade. But he realized that he might as well scold at the sparrows. At the bottom of the maidan the Military Policemen were drawn up, a dust-coloured rank with bayonets glittering. Verrall was facing them, but not in uniform—he seldom put on his uniform for morning parade, not thinking it necessary with mere Military Policemen. (obsolete) Posture of defense; guard. When Gabriel to his next in power thus spake. [The Tutor] should accustom him to make as much as is possible a true Judgment of Men by those Marks which serve best to shew what they are, and give a Prospect into their Inside, which often shews it self in little Things, especially when they are not in Parade, and upon their Guard. The ground where a military display is held, or where troops are drilled. A public walk; a promenade; now used in street names. He was parked on Chester Parade. […] at no great distance from them, where the shoreline curved round, and formed a long riband of shade upon the horizon, a series of points of yellow light began to start into existence, denoting the spot to be the site of Budmouth, where the lamps were being lighted along the parade. After walking a mile or two farther, they found that the shore was beginning to be formally embanked, so as to form something like a parade; the ugly lamp-posts became less few and far between and more ornamental, though quite equally ugly. (zoology, collective) (まれに) A term of venery denoting a herd of elephants on the move. (intransitive) To march in or as if in a procession. They paraded around the field, simply to show their discipline. […] it was her favorite amusement to array herself in the faded brocades, and parade up and down before the long mirror, making stately curtsies, and sweeping her train about with a rustle which delighted her ears. […] if you’re going to parade around with that robe hanging open you’re going to get yourself some bronchitis. […] Mrs. Parsons, the principal’s wife, would play the graduation march while the lower-grade graduates paraded down the aisles and took their seats below the platform. Stretcher after stretcher paraded into the lot—I was aghast; there seemed no end to them. (transitive) To cause (someone) to march in or as if in a procession; to display or show (something) during a procession. They paraded dozens of fashions past the crowd. They’re parading ad men through Congress to convince the lawmakers that Free Market is the way to go, and that Harry Truman is in league with Karl Marx. They kidnapped an Indian officer and beheaded him, bringing the head back to be paraded in the bazaars of Kotlin in Pakistani Kashmir. (transitive) To exhibit in a showy or ostentatious manner. I doubt if any woman on earth has gotten better effects than she has with black, white and red. Not only that, she knows how to parade it when she gets it on. […] I am sure neither of us cares to parade family business in a lawsuit. After the field show, it is customary to parade the stands before exiting the field. (transitive) To march through or along; (of a vehicle) to move slowly through or along. […] since it was no longer possible for him to parade the streets of the town, and be hailed with respect in the usual haunts of his leisure, this sailor felt himself destitute indeed. They said nothing, but stared at each other with the horror of people exposed to all the torture of the demons who parade the African continent. That evening the van of the Party for the Poor also paraded our street. They too blared music and made identical claims. (intransitive, military) To assemble to receive orders. Here it was we made our camp, within plain view of Stirling Castle, whence we could hear the drums beat as some part of the garrison paraded. Hooper had been detailed to inspect the lines. The company was parading at 0730 hours with their kit-bags piled before the huts. (military, transitive) To assemble (soldiers, sailors) for inspection, to receive orders, etc. In a few moments, we were paraded in the frigate’s gangway; the first lieutenant—an elderly yellow-faced officer, in an ill-cut coat and tarnished gold lace—coming up, and frowning upon us. (intransitive, of geese かつ other waterfowl) To march in a line led by one parent and often trailed by the other. Nearer to the water pink-footed geese and white-faced coots paraded in the groves of rhus and bamboo. parade in Webster’s Revised Unabridged Dictionary, G. & C. Merriam, 1913.
parade in The Century Dictionary, New York, N.Y.: The Century Co., 1911.